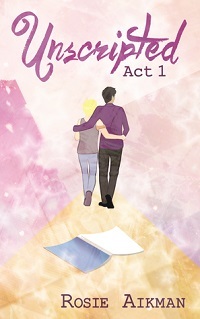 Welcome to my review of a new M/M contemporary romance, Unscripted by Rosie Aikman. The first in her Unscripted story, this title is a good beach or pool side read. A cute and mostly angst-free story highlight this M/M contemporary romance. Finn is a waiter, struggling to make ends meet and filling his free time with a prime-time police drama and his fantasies about the star, Ethan. A bit of an over-exuberant puppy vibe, Finn’s genuine excitement and need to enthuse over EVERYONE is a touch irritating, but like that puppy, you can’t help but appreciate his openness and friendliness. Ethan is an actor, like many, retreating behind characters to express feelings, emotions, and a bravado he doesn’t feel in real life. Handsome but incredibly shy and a touch insecure, feels as if his only realness is with the character he portrays. His character never quite reconciles the desire to be ‘more’ with the actuality, but there was an interesting person there just waiting to come out. The meeting is very ‘meet cute’ and the whole story is sweet. There are far more moments of tell and never quite enough show to allow readers to fully grasp onto the relationship, but the characters share a naiveté that harkens back to a first love and those tentative steps to couple hood. Both Finn and Ethan do intrigue: they are well matched and you want to see more from and for both of them. Secondary characters are suffering from a lack of depth: not enough to seriously bother, but I would have liked to have more depth overall: take the tried and true in a new direction, more showing of emotion and romance that would have brought the story from amusing pool side read, not requiring investment to a story where the characters demanded I pay attention and get invested in their story, to think about them long after. Life as a waiter, struggling paycheck-to-paycheck, doesn't leave much room for excitement. Finn Phelps finds his in Hot Blood, a prime time cop drama, and the actor who stars in it: Ethan Teller, beautiful, skilled, and shrouded in mystery. While she is not a stranger to American/English literature, Rosie Aikman draws her inspiration from the popcorn pocketbooks of Japan. While with Less Than Three Press, Ms. Aikman intends to capture the feel of Boys Love novellas, intending for a quick and easy read for her audience.